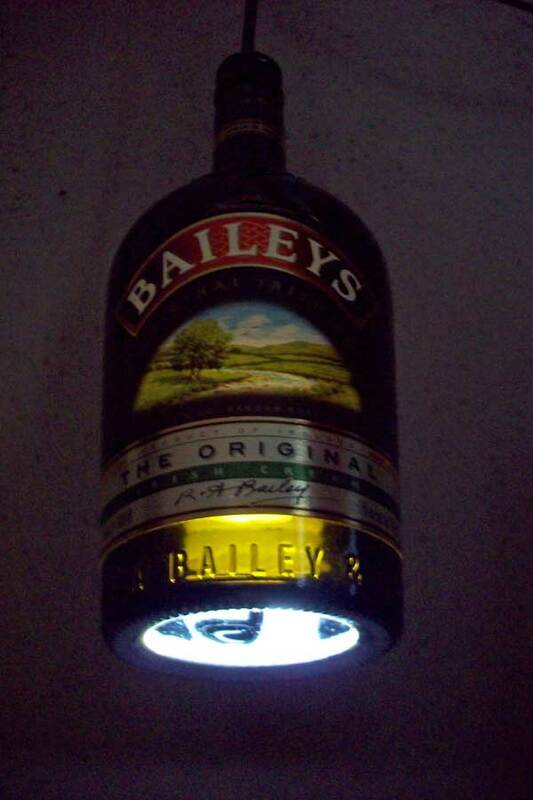 Our latest DIY Project is this pendant light made with a recycled Baileys bottle. After purchasing a Pendant Fitter kit for around $11 we brought it home to make our own pendant light. We wanted to use a fairly heavy Baileys bottle for this project, so we ended up not using the light fixture that came with the kit. This was our very first pendant light project and we used the kit as a guide to help us assemble the light. Trying to solder the old light fixture. Nick took apart the base lamp so he could feed the wires through the bottle. The next step was to drill a hole in the bottle cap and the Baileys bottle itself. 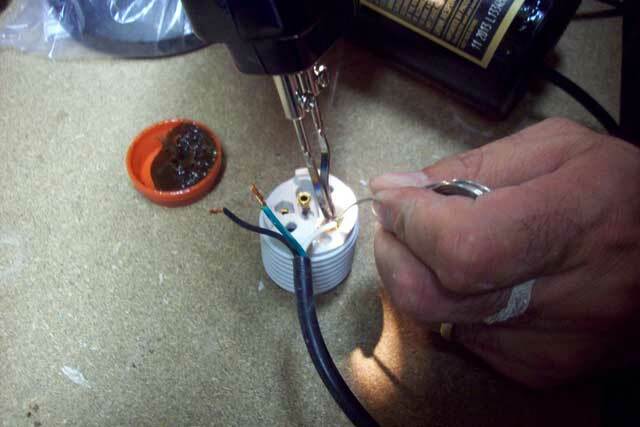 After feeding the wires through the cap and the bottle, Nick attempted to attach the original light fixture. Soldering the wires didn’t work and we didn’t want the bottle to rest on the ceramic base so we ended up doing away with the fixture all together. Luckily we also purchased a separate light fixture that we used instead. We were able to secure the wires using standard screws. On the top we secured the fixture itself to the pendant cord. This gave us additional support for the weight of the bottle. We put a bulb in the fixture and attached a plug in cord to test out our new pendant lamp. The result was quite spectacular. Not only did the bottle hold upright, but the light is shining through perfectly to illuminate the valley scene on the bottle label. Stay tuned, we will be making another pendant light in the near future. Maybe a three string pendant light using a variation of flavored vodka bottles. What do you think? Leave us a message below. We always love to hear from you. Hi KC, thank you for leaving us a comment. Nick uses a 2 in. or 2.3/8 in. saw hole from his 10 piece Diamond Hole Saw Set. We have a description and link for purchasing online on our resources page: http://www.bottle-lamp.com/resources/. You might be able to find a large enough drill bit or hole saw at your local hardware store as well. Good luck! I want to try to do that with this my bottle. I followed the link and saw your bottle. The bailey’s bottle I just simply drilled out the bottom. For your paticular bottle I think it would be easier to just take the bottom off. You could always use the bottom decorated rose part for a coin dish or something. Best of luck. Let us know how it turns out for you. I’m making pendant lights from liquor bottles and was wondering if I should cut the bottom off or drill a hole? Which is easier and is one way better than the other? Mark, Good question. I actually prefer cutting the bottom off. It allows easier access to the bulb and gives off more light then the drilled hole. The only thing that I noticed about the drilled bottle was that it kept the bottle’s original shape and made it look more natural. It will be a matter of personal preference for you.